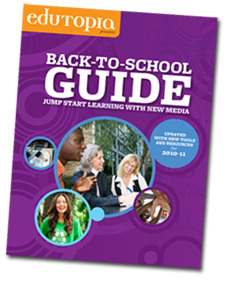 Recently, Edutopia published a guide - “Back to School Guide - Jump-Start Learning with New Media”. This guide is brimming with new media ideas, tools, tips and resources that can help those in the teaching profession get off to a good start in the new school year. It lists #10 Tips that can help educators adopt new technologies and easy-to-use tools to improve education and build a strong classroom culture. The guide suggests that collaboration is a skill students will need for the future. Making collaborative tools part of classroom practice, can help them work better together. If educators encourage their colleagues to use collaborative tools too, they can reap the benefits of teaming up for project planning and professional development. If you share a passion for improving education and are keen on discovering fresh ideas to engage your students, make learning more collaborative and build your classroom community, then you must check out this resource-packed collection of 10 top new media tips.